Around 93% of the world's children under 15 years of age breathe air that is so polluted it puts their health and development at serious risk, accounting for 1.8 billion children, according to a report published by the World Health Organization ahead of its first global conference on air pollution and healthin Geneva. In 2016, 600,000 children were estimated to have died from acute lower respiratory infections caused by polluted air. Air pollution is one of the leading threats to health in children under 5, accounting for almost one in 10 deaths among this age group, the report reveals. "This is inexcusable. Every child should be able to breathe clean air so they can grow and fulfil their full potential" said WHO Director-General Dr. Tedros Adhanom Ghebreyesus in a statement. Air pollution also effects neurological development and cognitive ability and can trigger asthma and childhood cancer, the report says. Children exposed to excessive pollution may also be at greater risk of chronic conditions such as cardiovascular disease in adulthood. "Air pollution is stunting our children's brains, affecting their health in more ways than we suspected. But there are many straightforward ways to reduce emissions of dangerous pollutants," said Dr. Maria Neira, director of the Department of Public Health, Environmental and Social Determinants of Health at the WHO. According to the WHO, children are more susceptible to pollution because they breathe more often, taking in more pollutants, and are closer to the ground, which is where some pollutants have higher concentrations. In few places is pollution more pertinent than India's most populous city, Delhi, where residents are bracing themselves for peak crop-burning season and the annual Hindu festival of Diwali, both of which add to a thick, toxic smog cast over the city. "Air pollution is one of the leading risk factors for the national burden of disease in India," the report states, adding that researchers tracked more than 1,000 women in India throughout pregnancy and found a direct correlation between increased exposure to pollution and premature, underweight babies. Air conditions are deteriorating quickly in the country's capital; 29 monitoring stations in the city on Monday recorded "very poor" air quality while four stations recorded air quality as "severe." Delhi is now the second most polluted major city in the world, according to air quality tracker AirVisual, second only to Lahore in Pakistan. "Weather conditions are projected to become adverse from November 1," warned the India Meteorological Department in a statement made last week. A task force led by the country's Central Pollution Control Board (CPCB) has recommended a ban on all construction activities in the Delhi-NCR region for 10 days beginning November 1 to reduce dust as air quality is expected to deteriorate. The average level of PM2.5 -- particulate matter smaller than 2.5 micrometers in diameterthat can dangerously clog lungs -- was 354 in the city on Monday. The WHO considers levels under25 to be acceptable for humans to breathe regularly. Among low- and middle-income countries, 98% of all children under 5 are exposed to PM2.5 levels above WHO air quality guidelines, the report found. In comparison, in high-income countries, 52% of children under 5 are exposed to such levels. The most recent air pollution data from WHO released in March gave India the distinction of having the world's 10 most polluted cities. Delhi's air is so polluted that residents could live as much as nine years longer if Delhi met WHO standards, estimated the Energy Policy Institute at the University of Chicago in a study published in 2017. 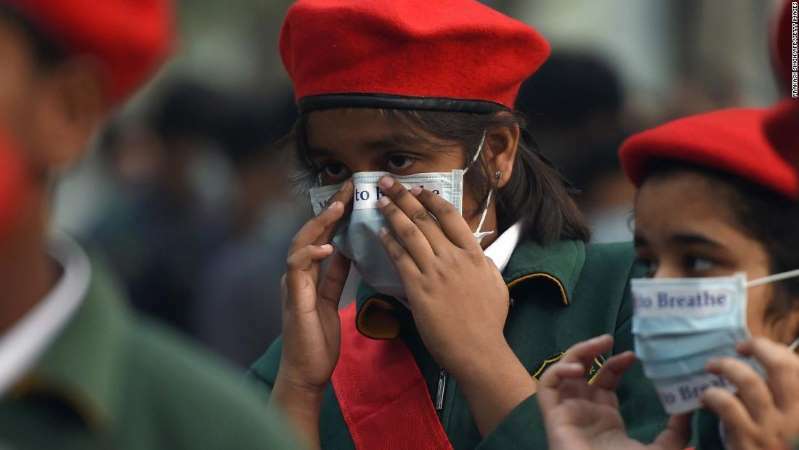 Last year, the Indian Medical Association declared a public health emergency because of alarming pollution levels and hospitals were clogged with wheezing men, women and children. Why is it so bad in India? As winter approaches, crop burning, firecrackers and a fall in temperatures fuel the annual deterioration in Delhi's already-poor air quality. Every year, farmers across fertile neighboring states set fire to their fields to clear them for the next season. Known as stubble burning, the practice means millions of tons of crop residue are set alight, releasing untold amounts of particulate matter into the environment. Stubble burning in the northern states of Punjab and Haryana contributed 32% of Delhi's overall pollution on Saturday, according to a report by the country's System of Air Quality and Weather Forecasting and Research (SAFAR). The authorities have tried to reduce crop burning by imposing fines and providing subsidies for alternative machinery, but for many farmers there is still no affordable alternative. The city is also preparing for Diwali, the annual festival of lights, which begins this year on November 7. Residents celebrate by lighting lamps and bursting firecrackers, which have caused a sharp spike in pollution levels in previous years. During Diwali last year, Delhi's air quality index reached 604 -- more than 24 times higher than the level the WHO deems safe. This year, authorities hope that a Supreme Court ban on the sale of most firecrackers will help prevent a plunge in air quality, though critics are skeptical about how effective the ban will be and how it will be enforced. In response to falling air qualityin India, the country'sEnvironment Pollution (Prevention and Control) Authority (EPCA) started implementation of a graded response action plan for the second year running, under which certain measures are taken as the air quality worsens. Measures introduced so far include a periodic mechanized sweeping of roads with heavy traffic, water sprinkling on unpaved roads and an increase in parking fees of up to four times. Rules are also enforced for dust control in construction activities and only trucks registered after 2005 are permitted entry into the city. If the situation gets bad enough, authorities will consider banning trucks and construction in the city altogether. Government bodies have warned Delhi residents to keep windows shut, wear masks and minimize use of private vehicles to curb the effects of increasing pollution in the city. They have also advised people to avoid outdoor activities in the coming days. The WHO says a range of actions are needed to curb the problem and protect the health of children worldwide, including the implementation of new policies to reduce pollution levels -- such as further reducing dependence on fossil fuels and aiding the use of renewable energy, providing greater resources to heath professionals, improving waste management and locating schools and playgrounds away from busy roads and factories. "WHO is supporting implementation of health-wise policy measures like accelerating the switch to clean cooking and heating fuels and technologies, promoting the use of cleaner transport, energy-efficient housing and urban planning," said the WHO's Neira. "We are preparing the ground for low-emission power generation, cleaner, safer industrial technologies and better municipal waste management."